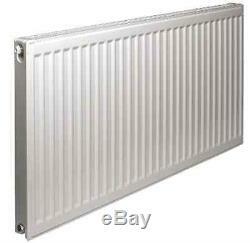 New Double Panel 600 x 2000mm Type 21 Central Heating Compact Radiator. Fitted with grilles and panels, the slim radiator design will suit any room. Manufactured to EN442 specifications, the radiators are tested to a maximum working pressure of 10 bar (regular central heating systems run at 1.5 bar), so they're suitable for both domestic and commercial central heating systems. They come with a 10 year guarantee for maximum peace of mind. Prorad radiators are suitable for two pipe installations. For single pipe applications it's advisable to use diversion tees in the pipework as this will assist in obtaining design performance from the radiator. Whilst these radiators are suitable for micro bore pipework, the back tappings make it unsuitable for twin entry valves. Everything required for installation can be found within the robust packaging. Brackets are of a strong design, with open top and deep slots, which facilitate easy and secure installation. Plastic inserts seat the radiator precisely on the bracket minimising expansion and contraction noise. The neat nickel-plated plug and vent provide a watertight joint, whilst complimenting the superior finish. Recommended height from the floor to the base of thr radiator is 150mm minimum. This allows adequate airflow when the radiator is placed on the bracket. Each Prorad radiator is subjected to a multi stage cleaning process before the paint is applied. This involves several rinsing stages, including an iron phosphate and demineralisation rinse. The first coat of paint is an environmentally friendly water based primer paint. The radiator is then stoved and cooled with a second powder coat in Warm White (RAL 9010) then applied followed by a final curing stage. Deliveries will be sent using a trackable parcel carrier where possible. These items can be sent to all standard UK post codes including Northern Ireland. We strongly advise you do not book any installers or engage in preparatory work until full receipt of your goods. Please note We will only deliver to the address on the order and couriered goods will not be left without a signature. Damages Please ensure you check all goods for any damage at the point of receipt and before signing for them. Any claim of transit damages after the package has been signed for will not be accepted. Goods signed for as goods not checked will also not be accepted. If you find the product damaged when the carrier is trying to deliver, inform us immediately and we will arrange a replacement. We strongly suggest you return the item using a trackable and insured means. If your order arrives damaged or incorrect, we will replace it free of charge. Products with up to a Lifetime Guarantee. Were proud of our competitive prices. All stock held and dispatched from UK. Be the First to Know. Get all the latest information on Events Sales and Offers. Sign up for newsletter today. The item "New Double Panel 600 x 2000mm Type 21 Central Heating Compact Radiator" is in sale since Saturday, June 25, 2016. This item is in the category "Home, Furniture & DIY\Heating, Cooling & Air\Radiators". The seller is "buildnet2" and is located in Newton Aycliffe. This item can be shipped to United Kingdom.